by ROBBIE WARD, The (Scranton) Times-Tribune LAKE ARIEL, Pa. (AP) — For more than a year and a half, Richard Krebs' search into his family history has taken an unusual twist, turning into what could be details of a late-night science-fiction movie. Late one night in his basement in October 2010, frustrated by dead ends in his genealogy search, Krebs typed his name and a German city into an Internet search engine. His name appeared on a website. What he saw next literally gave him goose bumps. "I kept thinking, 'Why is my picture on this website?' " said Krebs, a resident of Wallenpaupack Lake Estates in Paupack Twp. "I just kept looking at it." After the initial shock wore off, Krebs learned something that started as a bit eerie, but then turned into something special. In another part of the world, another man looks like him, even during many other stages of their lives; is the same age, 64, and shares the same name. They both live in rural areas. Even childhood photos of the two Richard Krebses have striking similarities. Soon, Pennsylvania's Richard Krebs - a retired Verizon employee who serves on the boards of trustees of Keystone College and the Community Library of Lake and Salem Townships - sent a package of photos to his German doppelganger. It included a letter translated into German by a librarian. "I tried to write it in such a way that wouldn't cause his heart to stop," said the American Krebs. The German Richard Krebs is the mayor of Bischbrunn, a community of about 2,000 in the state of Bavaria. When the German Krebs received the letter, the news surprised and intrigued him. 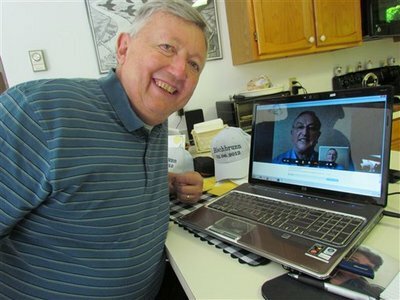 Before long, the two men began regular email exchanges and occasionally communicated via the online video chat service Skype. Before the two Richard Krebses communicated with each other, Pennsylvania's Krebs had traced his paternal family lineage to Germany through his grandfather and great-uncle entering the United States at Ellis Island in 1894 and 1901, respectively. His grandfather's last place of residence was Aschaffenberg, while his great-uncle lived in Weibersbrunn. The German Krebs lives eight miles between the two cities and has researched his family history to 1700. Through his assistance, the American Krebs traced his family roots to 1748. "We have no relation to each other," said Krebs of Pennsylvania. "But our families did live 2½ miles from each other in 1748." Watching the two men video Skype is uncanny, like watching a man looking into a mirror having a conversation. Having so much in common, they don't let a language barrier stand between their friendship. The German mayor's bilingual daughter translates. During a video chat on Monday, the two men discussed their friendship and plans to meet next week. The German mayor has coordinated with people in his community to organize the inaugural "Richard Krebs German-American Festival" on Saturday, which will include singing and a performance by a brass band. The German mayor will have his American counterpart and his wife, Kathleen, picked up in a horse-drawn carriage to arrive as the guest of honor in Bischbrunn. "Preparations are going up," said the German Krebs through his daughter's translation. During the two-week trip, the Krebses plan to visit many parts of Germany, exploring their ancestral homeland together. While technology has allowed many people sharing the same name to meet, these two Richard Krebses remain amazed by all of their similarities. Reflecting on the chance encounter, Krebs of Paupack said the world feels a lot smaller, calling his new friendship a "marvelous, happy coincidence." As the two prepare to meet, Bischbrunn's mayor said he hopes the experience will be unforgettable for his special friend and already has plans to visit him in the United States next year. After hearing about the welcome he'll receive in Germany, the American Krebs said he hasn't decided how he will match the hospitality in Paupack. "I've been telling people around here that I'm counting on their cooperation," he said.